Sunday January 20th 1884 I was busy about the work most of the day. Lee brought Hatt and Edith over and took them back. I went over to Folsoms in the evening. Monday January 21st 1884 I washed in the forenoon and went over to The Dental Clinic rooms in the afternoon to have some work done on my teeth and spent the evening at Hatts and Ott brought me home. Tuesday January 22nd 1884 I was busy about the work all the forenoon and went to town right away after dinner and was about town some after being at the dentists and was at Hatts a little while. Rob about the same. 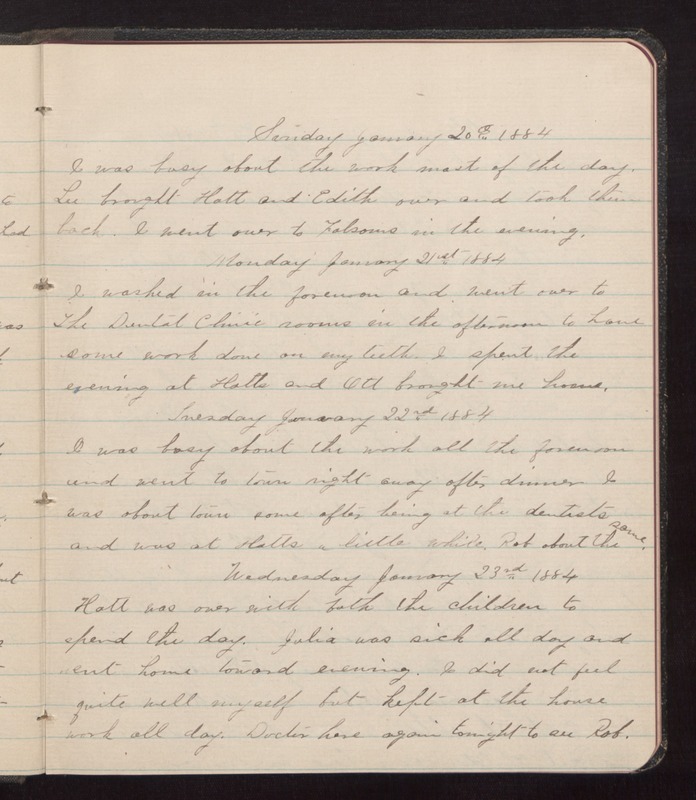 Wednesday January 23rd 1884 Hatt was over with both the children to spend the day. Julia was sick all day and sent home toward evening. I did not feel quite well myself but kept at the house work all day. Doctor here again tonight to see Rob.